FIRST TIME VISITING THE LANDER CHURCH OF CHRIST? 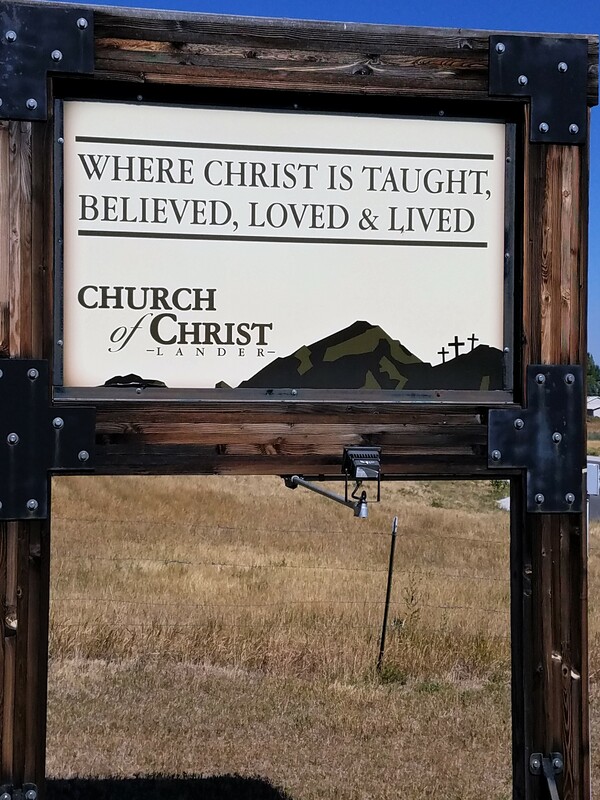 The Lander church of Christ, where Christ is taught, believed, loved, and lived. YOU ARE NOT THE ONLY VISITOR. We have numerous visitors and we are always pleased to have you. YOU WILL NEVER BE SINGLED OUT OR EMBARRASSED in any way. You do not have to register or sign your name to anything if you do not wish to. CONVENIENT PARKING PLACES and reserved spaces are available for the handicapped. You will find PLENTY OF SEATING in a spacious auditorium. There are no reserved seats, so you may sit anywhere. Each chair has a book rack with songs books and a Bible close by. OUR WORSHIP ASSEMBLY usually lasts approximately one hour. We are respectful of your time. You do not have to participate in any aspect of the worship that you do not want to. You can be a spectator if you wish. The order in which the following activities happen may vary each week, but you will be able to follow along. Except for the preacher, the men leading in worship are volunteers who are members of the congregation. PRAYER… There will be one or more prayers during the assembly. The people leading them will say what they wish rather than reading from a prayer book or reciting a prescribed prayer of some kind. Everyone in the worship assembly usually quietly bows their heads while the prayer is being offered to God. MUSIC… Several songs led by one of our men will be sung by the entire congregation. You are welcome to sing with us. The song leader will announce the number of the song, so you can find it in the song book. At times though, the song leader may choose to project the songs. One of the things that you will notice about us that is unique is that we do not use any instruments in our song service, like a piano or organ. This kind of music is called A cappella (or vocal music). It is meaningful and uplifting because it emphasizes the words and the beauty of the human voice. SCRIPTURE READING… Before our preacher’s message, there will be a passage read from the Bible. Occasionally you may be asked to stand out of respect for the reading of God’s word. The reader will tell us where the passage comes from in the Bible so you can follow as he reads, or it may be projected. MESSAGE… Our preacher will preach a Bible lesson that is usually 20-30 minutes long. His message is designed to be positive and encouraging, or to emphasize or illustrate a teaching from Christ. He does not use any titles like Reverend or Pastor and prefers to be called by his first name. COMMUNION… The Lord’s Supper is served every Sunday to every Christian who wishes to partake. Jesus instituted His supper in order for us to remember what He did for us on the cross. After praying, men will pass plates of unleavened bread symbolizing Christ’s body. Those who wish to partake will take a small piece to eat and then pass the plate to the person sitting next to them. Next, they will pass trays of small cups of grape juice symbolizing Christ’s blood. You can take one, drink it, and put the cup back in the tray before passing on the tray. GIVING… Our members give free-will offerings every Sunday to support the ministries of our church. Guests are not expected to give unless they wish to. Usually, the contribution plates are passed immediately after communion. INVITATION… At the end of the message, the preacher will encourage anyone who is not a Christian to become one and anyone who would like to commit to becoming part of our church family to make that known. The closing song is sung while the congregation stands to provide an opportunity for individuals to respond to the message or to ask for prayers. Sometimes, people are baptized at this point in our assembly. More than likely we will have the singing of one or more songs, the giving of announcements, and then a prayer may be offered before dismissing everyone to their Bible classes. Sometimes, instead of following this schedule, we may be meeting in small groups in different locations throughout the city called Life Groups or Small Groups. LIFE GROUPS/SMALL GROUPS… Sometimes we focus on a more personal fellowship. There are a number of small groups that may be meeting in homes throughout the city instead of at the church building. In these small groups of 5-15 people, you will find an in-depth Bible discussion followed by prayers. Each Life Group or Small Group usually concludes with some refreshments and extended fellowship time. LIFE GROUPS or SMALL GROUPS at times are held in lieu of meeting at the church building during a traditional mid-week service. Please check in the bulletin to find out if Life Groups or Small Groups are being held, and if so, what the locations and times are, or simply ask any member of the congregation. They would be delighted to help match you with a group that will meet your needs. You will find everyone in the auditorium listening to either a lesson, a devotional, or being involved in a discussion in a Bible class. The class or lesson usually is preceded by singing 2 or 3 songs and a prayer. At the conclusion of the lesson or class, there may be one or two more songs sung, some announcements, prayer requests given, and then a closing prayer. Please call to find out if there is a mid-week meeting or if Life Groups or Small Groups are meeting as seasonal options.